NLC's Federal Relations Update - Updated bi-monthly; provides a brief update on the status of legislative, court & federal agency activities impacting cities and towns.One of the purposes of the League is to represent cities and towns before state and national legislative bodies. Accordingly, it is the intention of League staff to make full use of e-mail, list serv, fax, voice, and regular mail to keep our members apprised of developments at the state capitol. 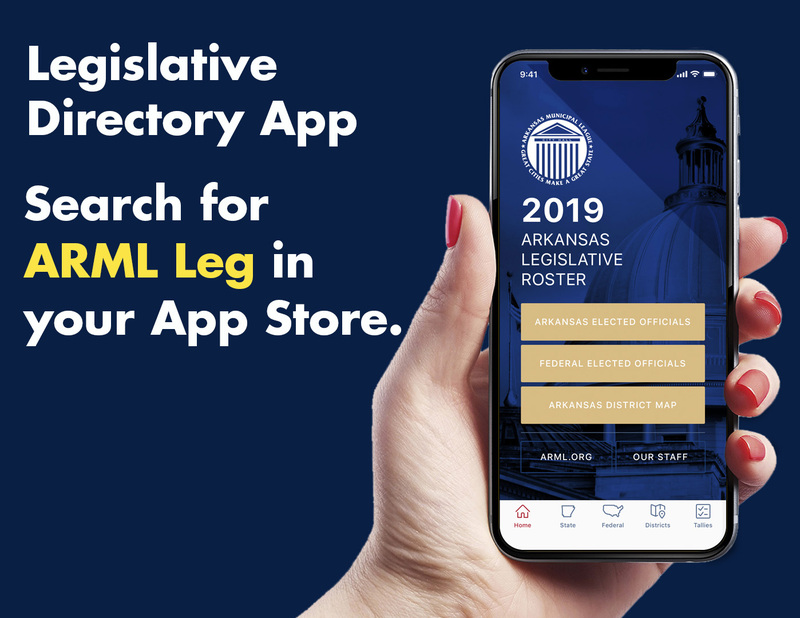 To track bills, the League's online version of its Legislative Bulletin including the League's position, introductions, amendments, and status of bills as they move through the legislature will be updated daily. Final acts adopted by the General Assembly will be available from this site. Legislative Bulletin - View all AML Bills of Interest. 92nd General Assembly - Regular Session 2019 - View the Arkansas State Legislature's website. Acts of Interest of the 92nd General Assembly - View all AML Acts of Interest. Legislative Tracking - Search a bill or act by number, sponsor, and cosponsor. Legislative Policies - View the League's Policies and Goals page. Find Your Legislator - View contact information for all Legislators. Legislative Committees - View all committees and their respective members. One of the biggest issues discussed at the League’s 83rd Convention in June was the issue of Internet sales tax collection. We are imploring Governor Asa Hutchinson to call a Special Session in order to pass legislation facilitating the collection of the existing Internet sales tax. With Amazon’s voluntary collection, many cities and towns have seen a sizable increase in May’s sales tax receipts over last May’s receipts. During Resolutions Committee meetings, the League distributed copies of a sample resolution on “Creating a Fair and Free Market” for all businesses in Arkansas. We urged and are continuing to urge our member cities to pass this resolution and send a copy of their adopted resolution to the Governor’s Office, to your local legislators and to the League. For those of you that may need a copy of the sample resolution, it is linked here for your convenience. If you have further questions, please call League Executive Director Mark Hayes at (501) 374-3484.